This week Our Friday Friend is California girl Ryann Salamon (rsalamon on SCS). Ryan has been a wonderful supporter of SASI from the get-go and you’ll want to check out her gallery full of adorable creations as well as her blog The Inked Spot. Let’s get to know Ryan a little better…. How did you become addicted to papercrafts? It all started last year when I was visiting my mom to figure out how to make my wedding reception invitations. I was going through her crafty magazines looking for ideas and I thought "Hey, I can do this! " I gravitate towards straight/clean lines and minimal layers. I love white card bases! What are your favorite projects to create? I love to alter journals and matching pens. They are great to give as gifts. Do you have a favorite SASI image? My favorite SASI image is the cat cupcake from the Trick or Sweet set. As soon as I saw it I had to have it! Thank you Ryan for being Our Friday Friend!!! YAY! I absolutely love Ryann's work! 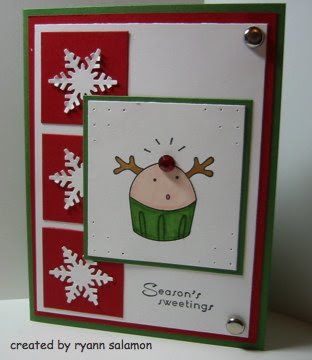 Thanks for the great recipe and for sharing the beautiful card. I am guessing that the bread bakes for one hour? The post ended with "Bake at 325 for one". Congrats Ryann! Fabulous Card! Love your blog too! So happy for you!